ZnO nanorods have been successfully synthesized by a simple microwave-assisted solution phase approach. Hydrazine hydrate has been used as a mineralizer instead of sodium hydroxide. XRD and FESEM have been used to characterize the product. The FESEM images show that the diameter of the nanorods fall in the range of about 25–75 nm and length in the range of 500–1,500 nm with an aspect ratio of about 20–50. UV–VIS and photoluminescence spectra of the nanorods in solution have been taken to study their optical properties. A mechanism for microwave synthesis of the ZnO nanorods using hydrazine hydrate precursor has also been proposed. Quasi one—dimensional nanostructured materials (nanotubes, nanobelts, nanorods and nanowires) have recently attracted considerable attention due to their novel properties and potential applications in numerous areas such as nanoscale electronics and photonics [1–3]. ZnO is an important electronic and photonic material because of its wide band gap of 3.37 eV and high mechanical and thermal stabilities at room temperature . The strong exciton binding energy of ZnO is much larger than that of GaN and the thermal energy of ZnO which can ensure an efficient exciton emission at room temperature [5, 6]. Room temperature UV lasing properties have been demonstrated from ZnO epitaxial films, nanoclusters and nanowires [2, 7–9]. Hence ZnO is a promising photonic material in the blue UV region. For example, as UV laser, it can allow reading compact disks with much more information and greatly increasing the amount of data stored . In addition, the low cost, high chemical stability and low threshold intensity make ZnO an ideal candidate for UV laser. The synthesis of one-dimensional single crystalline ZnO nanostructures has been of increasing interest due to their promising applications in nanoscale optoelectronic devices [1, 11–13]. The traditional approaches to synthesize one-dimensional ZnO nanostructures are the vapour phase transport processes with the assistance of metal catalysts, thermal evaporation and template-assisted growth [14–17]. But these processes may introduce impurities in the final product. Hence, it is conceived that preparation of one-dimensional ZnO nanostructures via chemical routes without involving catalysts or templates provides promising option for the large-scale production of well dispersed materials [18, 19]. Though single crystalline ZnO nanorods have been prepared by a modified microemulsion method , the diameters obtained were in the range of 150 nm only. Generally the preparation methods mentioned above involve complex procedures, sophisticated equipment and rigorous experimental conditions. Thus, the development of low cost and mild synthetic routes to ZnO nanorods or nanowires is of great significance. Herein, a novel and facile method for the preparation of ZnO nanorods by microwave irradiation technique is presented. The method employs a novel hydrazine hydrate complex precursor route and mild conditions. Zinc acetate and hydrazine hydrate were mixed in a molar ratio of 1:4 in water under stirring. Hydrazine readily reacted with zinc acetate to form a slurry-like precipitate of the hybrid complex between them. The stirring of the slurry was continued for 15 min and then the mixture was subjected to microwave irradiation at 150 W microwave power for 10 min. The slurry became clear with a white precipitate at the bottom. 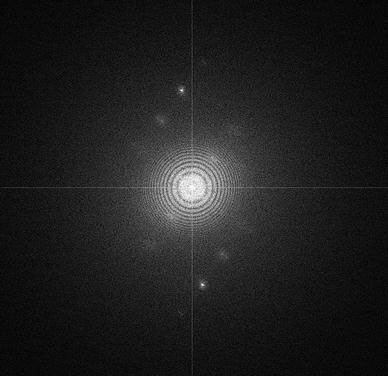 The precipitate was filtered off, washed with absolute ethanol and distilled water several times and then dried in vacuum at 60 °C for 4 h.
X-ray diffraction patterns were taken on a Japan Rigaku D/max rA X-ray Diffractometer equipped with graphite monochromatized high intensity Cu Kα radiation (λ = 1.54178 Å). The accelerating voltage was set at 0.06°/s in the 2θ range 10–80°. The field emission scanning electron microscopy (FE-SEM) images and energy dispersive X-ray analysis (EDXA) were carried out on a FEI Company FE-SEM. Electron diffraction (ED) patterns and the transmission electron microscope (TEM) images of the nanorods were recorded on a JEOL (JEM 3010) transmission electron microscope operating with an accelerating voltage of 300 kV. UV–VIS and photoluminescence spectra of the ZnO nanorods were measured at room temperature under carbon tetrachloride dispersion on a Perkin Elmer UV–VIS and Photoluminescence spectrometers. The powder XRD pattern of the as obtained ZnO nanorods is shown in Fig. 1. 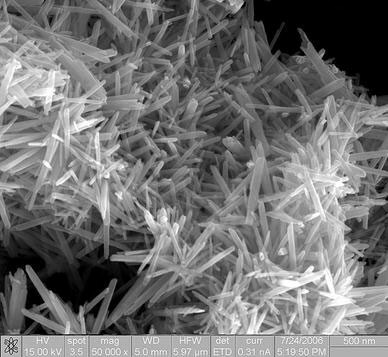 All the peaks of the nanorods can be indexed to the wurtzite single phase ZnO with high crystallinity (JCPDS Card No. 36-1451, a = 3.249 Å, c = 5.206 Å, space group:P63mc, No.186). 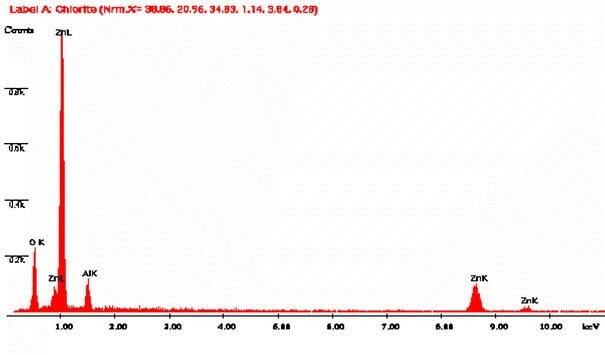 No characteristic peaks of other impurities such as Zn(OH)2 were detected in the diffractogram. The higher intensity of (002) peak compared to bulk ZnO indicated the growth orientation of ZnO nanorods towards C-axis . The diameter of the nanorods calculated using Scherrer formula ranges between 25 nm and 75 nm, which also corresponds to their diameters observed by FESEM. The XRD pattern of the zinc acetate–hydrazine hydrate complex precursor is shown in Fig. 2. The peaks could not be indexed to any known single compound indicating that this may be a complex mixture of oxides and hydroxides or an adduct. 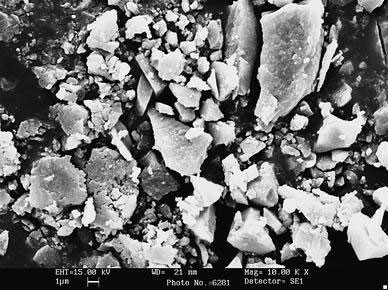 Further, the SEM image of the precursor (Fig. 3) also does not show any interesting morphological features compared to that of the product i.e., ZnO (Fig. 4). These features clearly indicate the differences between the precursor and the product and also the important role played by the microwave irradiation which converts this precursor to well-defined nanorods. 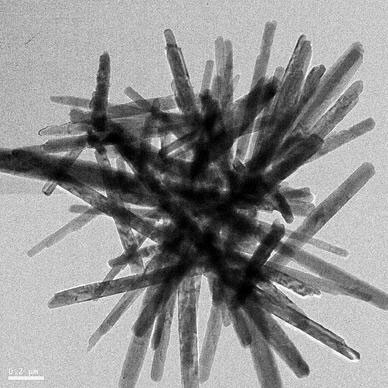 The FESEM image of the nanorods is shown in Fig. 5. The FESEM image reveals that the diameters of the ZnO nanorods are in the range 25–75 nm, and length in the range of 500 nm−1.5 μm. The EDXA analysis presented in Fig. 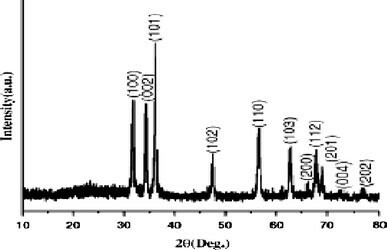 6 shows that the as-prepared ZnO nanorods contain Zn and O only (the Al peak in the spectrum is due to the background from the FESEM Al grid) and in the atomic ratio of 1:0.7, indicating the presence of oxygen deficiency, which might have been caused during the rapid formation of ZnO nanorods under microwave irradiation. Figure 7 shows the TEM image of the representative nanorods which further supports the results obtained by the FESEM images. The ED pattern of the nanorods is shown in Fig. 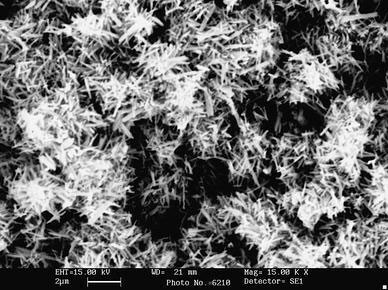 8 suggests the single crystalline nature of the nanorods and can be indexed to the wurtzite single phase ZnO. The preferential growth direction of these rods was along the c axis of the crystal lattice. 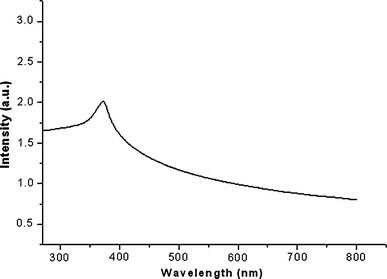 The room temperature UV–VIS absorption spectrum of the ZnO nanorods is shown in Fig. 9. The spectrum shows a typical exitation absorption band at 372 nm that is blue shifted with respect to the bulk absorption edge which appears at 400 nm, this shift may be ascribed to the nanometric size effect of the synthesized ZnO . 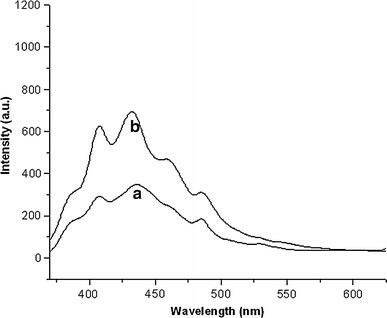 The photoluminescence spectra of the ZnO nanorods have been measured with an excitation wavelength of 325 (curve a) and 350 nm (curve b) and are shown in Fig. 10. The photoluminescence spectrum at both the wavelengths exhibited similar features. However, the intensity of the luminescence at higher excitation wavelength was higher than the lower one. The following emission bands have been observed: A UV emission band at 385 nm, a violet band at 407 nm, a strong blue band at 459 nm, a blue green band at 485 nm and a green band at 529 nm. The UV emission band is due to the recombination of excitonic centres in the nanorod and also as a result of quantum confinement effect . The green emission corresponds to the singly occupied oxygen vacancy in ZnO and results from the recombination of a photo-generated hole with the single ionized charge state of this defect. The weak green emission also implies that there are few surface defects in the ZnO nanorods, which is in agreement with the result obtained from EDXA observation [22, 23]. Although the blue emission has been reported in the ZnO nanorods, the mechanism is not clear [5, 24]. It is worthwhile to note here that under microwave irradiation, zinc acetate with only ammonium hydroxide does not yield any nanomaterial. Hence it may be concluded that it is the hydrazine complex which does the magic by acting both as a ligand and as a capping agent to yield 1D nanomaterial. A facile route for the synthesis of ZnO nanorod by microwave irradiation method has been reported. The method offers a very simple and low cost route for the production of ZnO nanorods. ZnO nanorods have been characterized by XRD, FESEM and EDXA. A possible formation mechanism has been proposed via a zinc acetate–hydrazine hydrate complex formation. Hydrazine hydrate complex acts as ligand and capping agent facilitating the formation of ZnO 1D nanomaterial. The method may also be extended for the preparation of other nanomaterials. Financial support in the form of a young scientist project grant and a SERC visiting fellowship from DST, Government of India is gratefully acknowledged. The author is also thankful to Prof. CNR Rao of JNCASR, Bangalore, for laboratory facilities and encouragement.